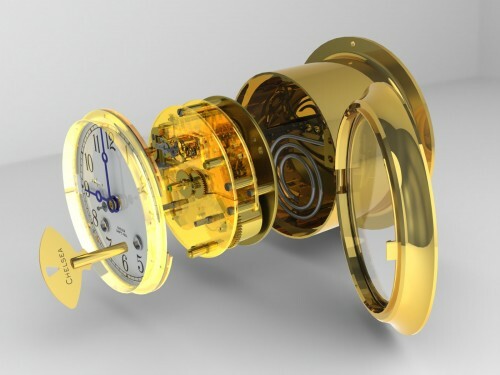 A modern CAD rendering demonstrating the assembly of our classic Ship’s Bell clock. Here at Chelsea Clock we pride ourselves in making the highest-quality mechanical clocks the old fashioned way. But some of our newer, more accessible models do utilize quartz technology, which leaves many customers wondering: What’s the difference between quartz and mechanical clocks? And how does a mechanical clock work? Mechanical clock technology preceded quartz movements by nearly a thousand years. Unlike their digital and quartz counterparts, mechanical clocks don’t depend on a battery to keep time. Instead, they harness the energy stored in a wound spring — which is why all mechanical clocks must be wound in order to continuously keep accurate time. Every mechanical clock needs energy in order to run. Winding your clock actually winds an internal main spring — and when the main spring slowly unwinds, it puts a series of parts in motion which results in the turning of the gears. Perhaps the most important component inside a mechanical clock is known as the escapement. The escapement regulates the release of stored energy into a predictable curve, which translates into the motion of the hands around the dial. The final element in the escapement is an oscillator, usually a balance wheel or pendulum. The rate of the oscillator is constant, resulting in the controlled release of the energy stored in the mainspring (or, in the case of larger clocks, the gravitational pull on a weight). Each swing of the pendulum or balance wheel releases a tooth on the escapement’s gear, which allows the clock’s gear train to advance by a fixed amount, moving the clock’s hands forward at a steady rate. For decades Chelsea mechanical clocks have been the trusted timekeeper of the military due to our unmatched accuracy, precision, and craftsmanship. How do i measure a clock. i want to know size of clock. I’m not sure I understand your question. Are you looking to measure your own clock or one you’re hoping to purchase? I’m interested in the differences between quartz and mechanical clocks and how they work.